Cozy up on the couch in this comfy PJ set! These trendy jammies are great for any special occasion, or just because. The top to this set is a classic raglan style tee and you have the option to choose from a plaid or polka dot pattern for the bottoms. This pajama bundle is perfect for matching couples, Valentine's Day, matching families, and more. Get started by customizing the t-shirt in our easy to use design center. Single and not ready to mingle on Valentine's? 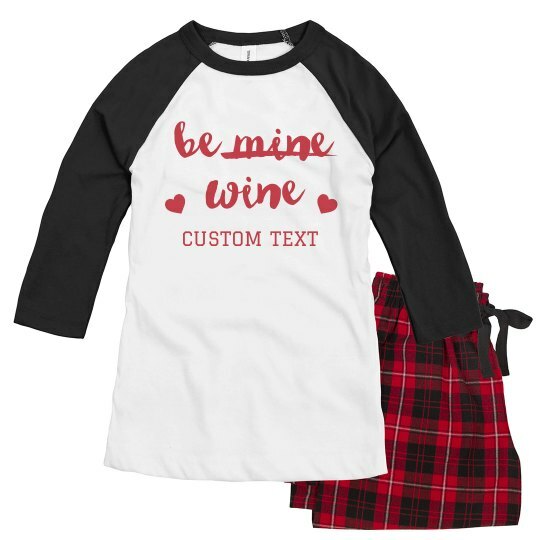 Customize this BE WINE shirt by adding your name or whatever words you want to put in. Remember, a wine will never leave you hanging because any friend of wine will also be a friend of mine!